My art career started at the age of two, when my mother discovered I could make copies of pictures I saw. It progressed through high school, college art courses and many workshops. My art life has taken many paths, because I am fascinated by all the possible ways of producing a work of art. I lived and worked as an artist for 38 years in Europe, various locations in Germany, Italy and Spain. I also lived for a year in Morocco. I now call Fredericksburg home and plan to remain here, producing art as long as possible. 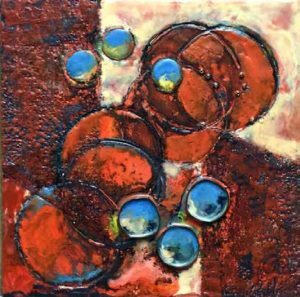 The May FCCA Members’ Gallery show will focus on encaustics done by Jane Forth and Sally Rhone-Kubarek. Encaustics (from the Greek word enkaustikos, meaning to burn in) is a very old art medium employing both wax and heat used by both the ancient Egyptians and Greeks. Funeral portraits have survived from the first century BC. There are many ways of creating an encaustic, but the one requirement is heat. One of the reasons for a resurgence of interest in this medium is that now, thanks to electricity, it is easy to control the temperature of the waxes. Hot wax with the addition of color pigment and dammar varnish are applied to a sturdy surface and then reheated to fuse them to the background. This is the basic process, but there are many ways of adding interest and texture. Collage is easy, because materials stick to the wax surface and harden in place. The surface may be sculpted or textured and the groves filled with pastel, oil paint or other mediums and then fused in place. Simply reheating the surface causes the colors to move around into different patterns. Adding shellac to the surface and burning causes interesting web patterns. The medium is very versatile and subject to many happy accidents. 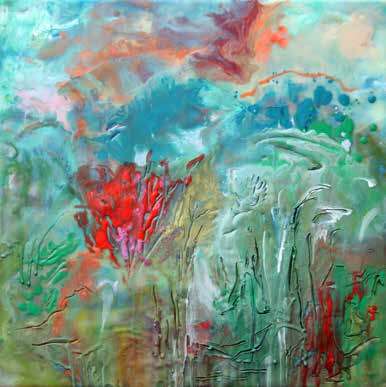 In their exhibit Antique Colors, Jane Forth and Sally Rhone-Kubarek create work using encaustic painting methods. This painting medium, comprised of heated pigmented beeswax, is an invention of the ancient Greeks; the word encaustic derived from enkaustikos -- to burn in. Jane Forth lives in the rural Northern Virginia Blue Ridge, close to the Appalachian Trail. The beauty of the land, presence of wildlife and the growing seasons of gardens are the life of this environment. Forth thinks of beeswax as a mystical material, giving one appreciation of nature and that its fragrant translucent properties express an imaginative and creative voice. 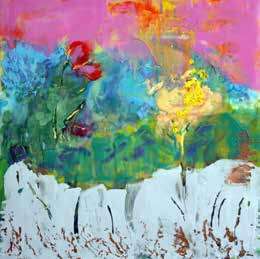 In working to harmonize color and innovate form, she generally begins painting with an image or an idea of landscape from her studies of places close by her home. During the process of painting, color and form become abstractions and through the fluidity of molten wax, she finds creative techniques. Often using traditional methods of brushing paint, she also pours wax medium, carves and scrapes the surface. 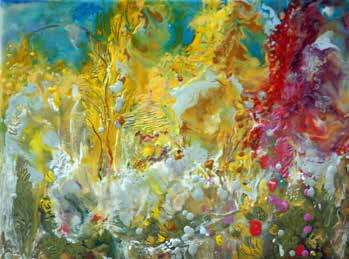 Within spontaneous changes and a journey of revisions her work is complete when there is a sense of visual rest within the translucency of wax, color and spatial concept. Forth has exhibited at the FCCA since 2015 and this is her second Members’ Gallery show. She has exhibited work in the Greater Washington D.C. area and Virginia since 1975, after completing a BFA at the University of Pennsylvania and Pennsylvania Academy of Fine Arts. 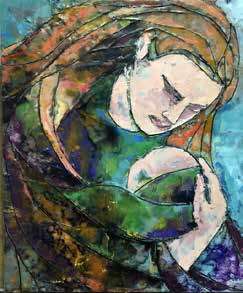 Currently, she is a member of Middle Street Gallery, Sperryville, Va., and active in Women’s Caucus for Arts, a national organization supporting women in the arts. She is a member of Encaustic Art Institute as well as International Encaustic Artists and has exhibited her work at the International Encaustic Conference.